Versatile and very modern looking our D-end table is a great item to use in combination with our other meeting tables. It allows you to create bespoke surfaces for meetings, studying and lectures for example, or feel free to use as a standalone item too. Tables are associated with many activities, but perhaps the most common one these days is sitting down and eating! This wasn’t quite what tables were associated with when they were first invented. Although the ancient Egyptians used an early type of table to serve food, it’s very unlikely that people gathered around it to sit down and enjoy a meal. This is because a table from this era generally featured a stone pedestal with a platform or plate on top for food. In a different continent chinese populations often used tables for arts and crafts, and they designed one with a slanted top specifically for hobbies. These examples show that tables used to be very versatile and they still are! Over the years many different designs were created, some for very specific purposes - such as the 19th Century work tables, which were manufactured especially for people who sewed a lot. It offered drawers for keeping thread and material as well as a practical shape that didn’t take up too much room. In the 17th Century a certain kind of product became very popular - folding tables! As ever, design reflects necessity, and as people started to enjoy more banquets, there was a need for tables that could be set up and taken down when required. 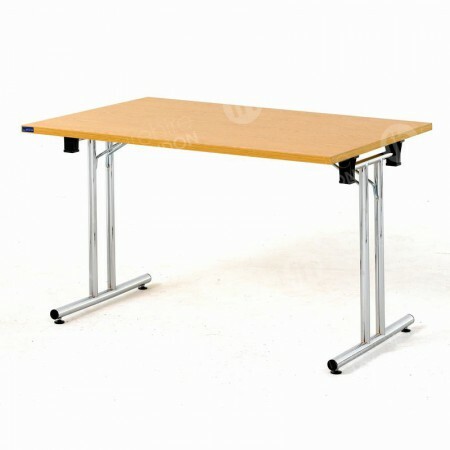 Folding tables were the obvious solution and we think this is an enduring design that is very useful today. We’ve had many items from our table hire in London range designed to our high specifications, including our D-end table. We’ve made sure to include some top quality features, with one of them being a folding leg mechanism. One of the reasons the 17th Century folding table was such as hit, was that it could be easily set up, taken down and stored - exactly like our D-end model! So we’ve made sure to include such an important element in our range. Although it might have it’s roots in the 1600s, this table is exceptionally modern, and the mechanism allows you to set up each table in just a few seconds and with minimal effort - it’s really that easy! Other fantastic benefits to our D-end tables is the very modern material used for its surface - 25mm melamine. This is an exceptional robust substance that is manufactured so it’s heat and stain resistant, so whether you’re using it for work, dining, or exhibitions, the hardy veneer won’t let you down. In addition to being very robust, the surface of our D-end table is very modern too, thanks to the light oak finish. It looks very stylish and chic in any contemporary surroundings, with the chrome legs complementing it’s appearance even more. It’s a popular choice for all kinds of locations, from offices, to educational institutions, to receptions, meetings, conferences, exhibitions, product launches and many more events and premises. 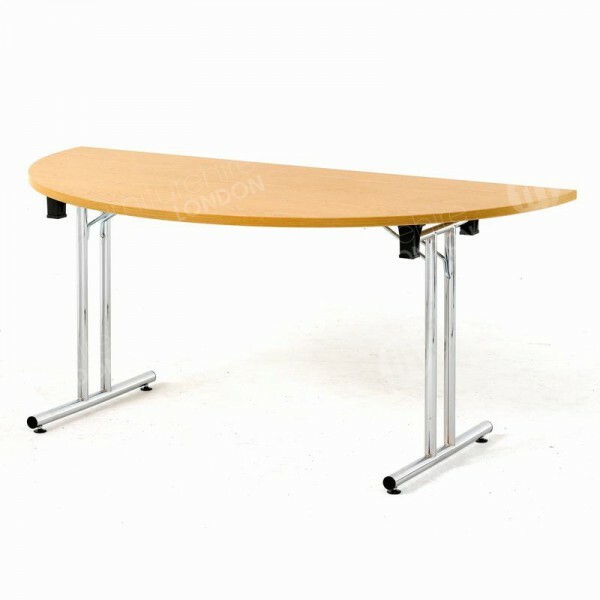 A factor that really sets this table apart from traditional rectangular and circular meeting tables is its D shape. You’re free to combine this with collections of our rectangular meeting room table in order to create larger oblong shapes that are perfect for meetings, such as our medium and large meeting tables. Or if you prefer you’re free to use it on it’s own, as a location for refreshments, notes, office equipment or other items. Feel free to order this on it’s own or as part of a collection, and when your event has finished then it can be taken down and stored with hardly any effort at all. Believe it or not, just a few seconds! Simply unfold the legs and it’s ready. Extremely. 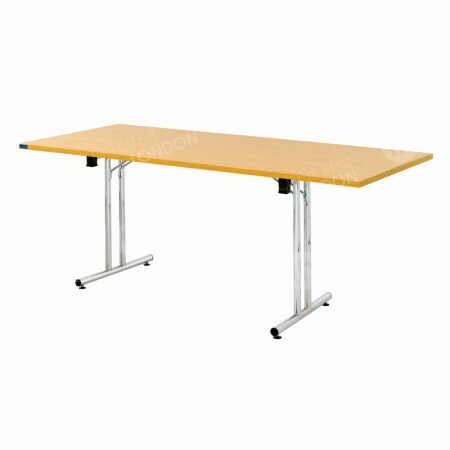 You can combine it with a selection of our rectangular tables to create both medium and large meeting room tables, perfect for those group activities and get togethers in schools, colleges, in businesses and at conferences.